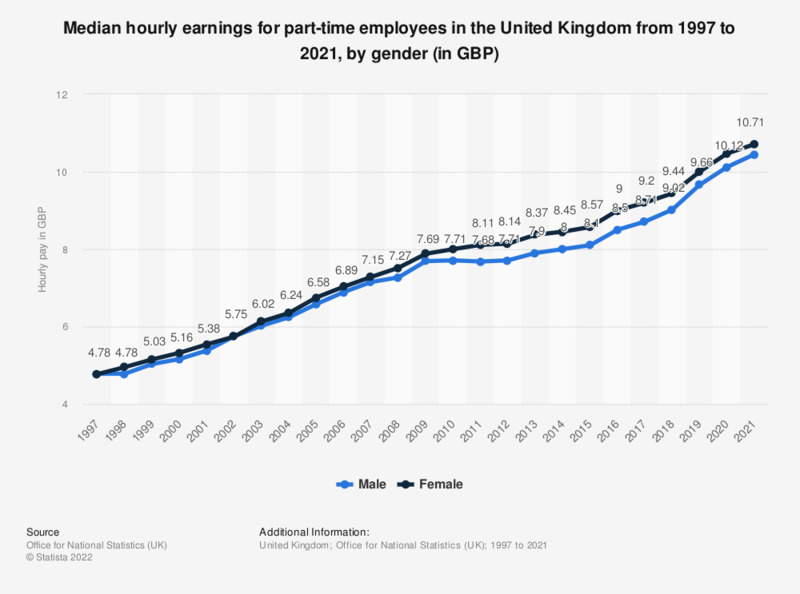 This statistic shows the average hourly gross earnings (excluding overtime pay and hours) in the United Kingdom (UK) from 2006 to 2018, by gender. The male figures are consistently lower than those of females. In 2006, females earned on average 15 pence per hour more, while in 2018 the difference was 4 pence. The general trend shows that the wage gap is decreasing. *Part-time defined as employees working 30 paid hours or less per week (or less than 25 for the teaching professions). ** Due to classification changes in 2010, there is a discontinuity from 2010 to 2011. The 2011 figure used is that using the latest (2010) classifications. This makes the 'Male' figure 3 pence lower than with the old classification and the 'Female' figure 7 pence lower. Everything On "Earnings and wages in the United Kingdom (UK)" in One Document: Edited and Divided into Handy Chapters. Including Detailed References. Statistics on "Earnings and wages in the United Kingdom (UK)"